Northern Kentucky will have a great representation of football in the State Tournaments once again with 2 teams headed down to Western Kentucky University this weekend. 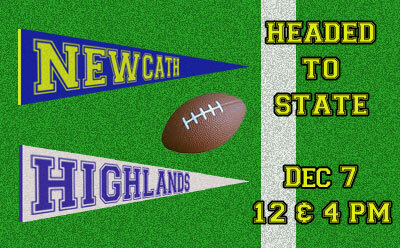 NewCath and Highlands will be playing back-to-back in the Russell Athletic/KHSAA Commonwealth Gridiron Bowl on Saturday. The Breds play at 12 NOON EST while the Birds play at 4PM EST. We will have broadcast links to both games on the website. Good luck to all the teams down State! DeSales (13-1) defeated Murray last week 38-0 and will now face NewCath (10-4). The Colts' only loss of the year was to Louisville Christian Academy 27-24 on October 18. DeSales is led by QB Nathan Roush and RB Dylan Byrd. Roush has passed for 1,055 yards and 10 TD's while also rushing for 928 yards and 14 rush TD's. Byrd leads DeSales in rushing with 1,889 yards and 34 TD's. NewCath defeated Somerset in Double Overtime last week 49-48 to advance. NewCath is led by QB Mac Franzen, RB Jacob Smith and LB/RB Jack Sutkamp. Franzen has thrown for 1,983 yards and 24 TD's and has also rushed for 599 yards and 6 rush TD's. Smith leads the Breds in rushing with 954 yards and 13 TD's. And Sutkamp not only has 10 rush TD's but has recorded a total of 195 tackles on defense for the Breds. The Breds are looking for their 2nd straight State Championship and 6th overall. Since 2005, NewCath is 2-1 against DeSales and lost their last game to them in 2009 23-10. Collins (12-2) will once again meet Highlands (13-1) in the Class 4A Championship game this year. In last year's Championship game, the Bluebirds shutout the Titans 47-0. Collins defeated Owensboro last week 50-14 to advance. Their only two losses have come to Simon Kenton and Central Hardin. The Titans are led by QB Lawson Page and RB Ryan Watkins. Page has thrown for 3,036 yards and 37 TD's and has also rushed for 448 yards. Watkins leads the Titans in rushing with 1,079 yards and 15 TD's. Highlands defeated LexCath last week 49-35. Their only loss of the year is to Elder. The Bluebirds are led by QB Drew Houliston and RB Zach Harris. Houliston has thrown for 3,660 yards and 48 TD's. Harris leads Highlands in rushing with 1,000 yards and 21 TD's. Highlands is looking for their 7th straight State Championship!